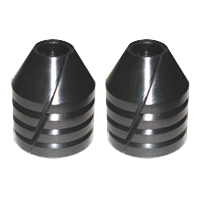 Cone Packing | Stuffing Box Rubbers - Global EEE, Inc.
Our stuffing box cones and rings are designed to create a solid inner seal for polished rods to efficiently ride through. In addition, because we’re a full-service elastomeric product supplier, our cone and v-ring packing solutions are specifically manufactured to reduce friction, wear and, above all, heat. The end result of using our high-quality cone packing products is a cleaner, safer and more productive work area for both your rigs and your employees. Cone Packing, High Temp with brass has successfully been used in the Kern River Oilfields for over 15 years. We are told the operating temperatures in which this packing is used range between 220 and 350 degrees F. We utilize a high grade Nitrile synthetic rubber compound, with or without brass. Our highly versatile rubber cone packing products are made to withstand wear and damage from oil, gas, mud and other debris that can shorten the lifespan of lesser made products. Furthermore, whether you’re in the market for cone packing with hard rubber or cone packing with soft rubber, our more than 50 years of experience as an oilfield elastomeric product supplier means you’ll always get products that are guaranteed to be free of defects. Browse our selection of Hi-Temp Brass, Teflon, Solid and Hollow Cone Packing Elements below. If you do not see what you're in need of, please contact us to talk in more detail about your application and needs. With our extensive in-house design and engineering capabilities, custom molding requests are no problem for us. No matter your needs, we’re always able to give your order the attention it deserves to result in a cost-effective product that’s delivered to you in a timely manner. At Global Elastomeric Products, Inc., we’ve been supplying rubber cone packing for cone type boxes — as well as a full line of other elastomeric products — for the oil and gas industry for well over five decades. In that time, we’ve been committed to providing first-class customer service so you always get the help, advice and insight you need to keep your operations running smoothly and productively. And because we’re an ISO 9001:2008-registered company, our quality control processes are some of the strictest in the industry — meaning you can count on our products to be free of defects. The bottom line is that our products have proven effective in various fields with diverse conditions throughout the world. Contact us today for more information or a no-obligation quote on our cone packing elements.